This indispensable, practical guide shows you how to create superior customer value and get paid for it. “Michael Chase has written a clear and practical guide to customer value as the strategic heart of product management success. The concrete capital equipment examples are an important ingredient that helps to make this book so clear. 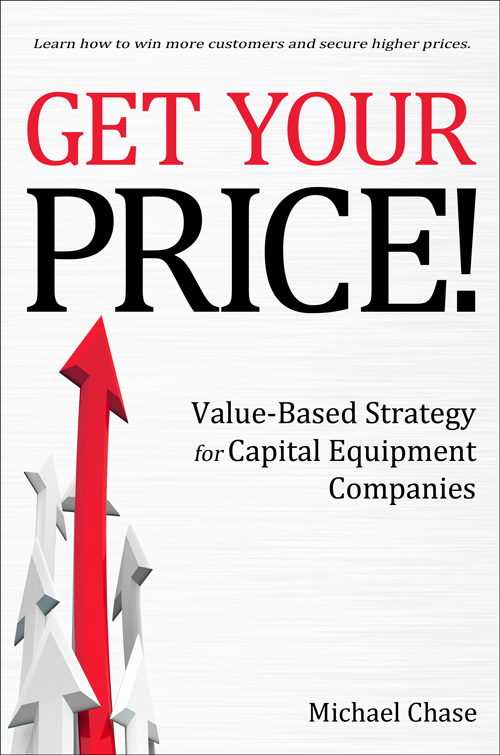 But it is also a worthwhile read for companies beyond those that produce capital equipment. “I have worked closely with Mike at three different equipment companies. In each case, he transformed how we thought about creating customer value and helped us get paid for it. Mike shares his battle-tested approach in this exceptionally useful book. If you want to reach your customer-value creation and capture potential, read Get Your Price!. To make sure you’re not leaving any money on the table, read this book! You get the capital equipment industry’s best practices for strategy, product management, and marketing. This is your guide for growing your business, improving profits, and beating the competition. John Peeler, CEO, Veeco Instruments, Inc.
David Gray, Ph.D., VP of Strategic Development, GT Solar International, Inc.
John Aldeborgh, President and CEO, Innopad, Inc.
Bertrand Loy, Executive VP and COO, Entegris, Inc.
Michael Luttati, VP of Global Services, Teradyne, Inc.
Greg Redinbo, Ph.D., Director of U.S. and Europe Sales, Varian Semiconductor Equipment Associates, Inc.
Insightful and easy to read – an indispensable Rosetta Stone for success in the high-technology capital equipment business.